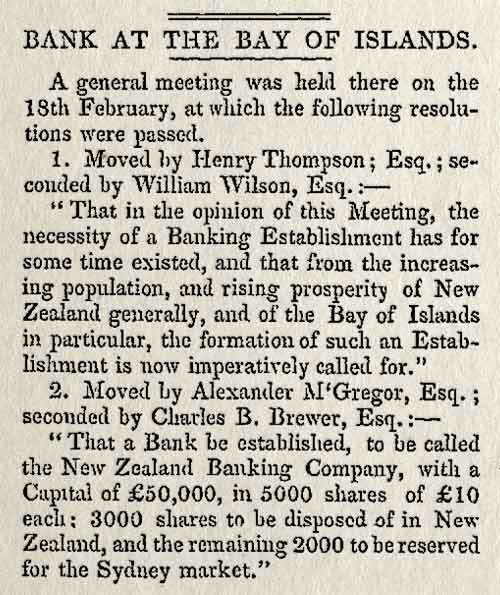 This report from the New Zealand Gazette and Wellington Spectator on 2 May 1840 tells of the meeting that launched the first offering of shares in New Zealand. The shares were in the New Zealand Banking Company. Two thousand of the 5,000 shares were offered for sale in Sydney where they were all taken up within two days. The founders of the company were prominent townsmen of Kororāreka (later Russell) in the Bay of Islands.